Grace Visquera is a bookkeeper who works from home, and part of her job entails dealing with a lot of paperwork for her clients. She stashes all of these within the small home office that she managed to carve out for herself from the space beneath the stairs. “This was my main problem. Dati kasi, malaki yung bahay, tapos naging cluttered na siyang tignan because of my work table and because of my files. And then siyempre maghapon ako nasa bahay, napapagod na ako sa itsura niya!” she says. 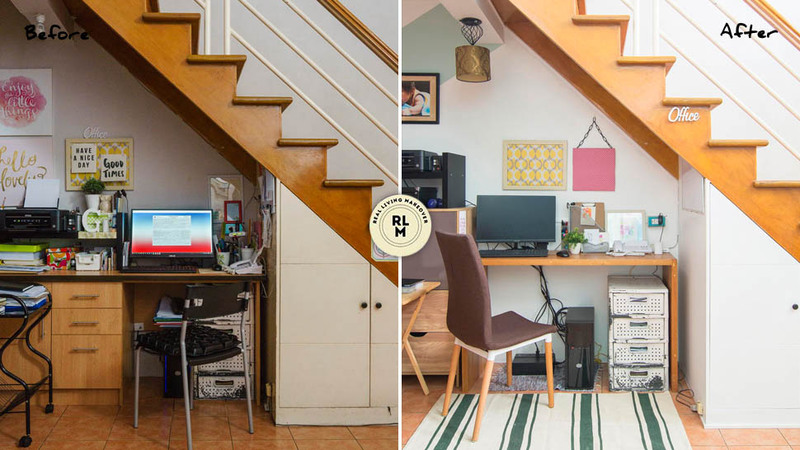 Decorator Grace Moslares of Magara Designs wanted to take away the focus from the cluttered home office, though she also wanted to maintain the location, which maximized the small nook under the stairs. The Visquera home office stayed put underneath the stairs, but rather than it being the focal point, it now blends well with the rest of the space. The old, bulky work desk that was made out of spare pieces of wood was replaced by a slimmer desk (that the Magara team re-sized) from Avino Fine Living. The distressed white filing cabinet was retained, as it still serves as good storage.